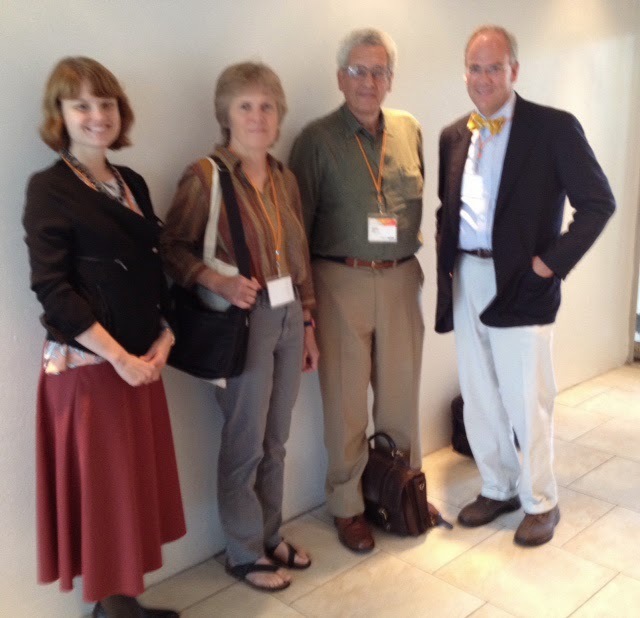 Members of the AFoH board participated in a session at the 2014 annual meeting of the Southeastern College Art Conference in Sarasota, Florida, Oct 8th-12th. The theme of the conference was NEXUS: From Handmade to HighTech, and the AFoH session, not only provided an update on current research at the site, but also proved to be an excellent opportunity to promote new membership for AFoH. The session was chaired by Carol Mattusch of George Mason University, Chair of the AFoH board, and Roger Macfarlane of Brigham Young University, AFoH board member. Mattusch opened the session, entitled, “From Ancient Roman Herculaneum to the Ringling Museum: Handmade or High-Tech?” with remarks about the history of the Bay of Naples and the rediscovery of Herculaneum. Erika Zimmermann Damer of the University of Richmond, read the second paper, “Herculaneum Graffiti for the (Twenty-) First Century.” Damer, together with Rebecca Benefiel of Washington and Lee University and Holly Sypniewski of Millsaps College, have pioneered the Herculaneum Graffiti Project, the only American epigraphical field school that is open to undergraduates and one with a large component of digital humanities. The ongoing project exemplifies the very essence of this year’s conference theme – From Handmade to High Tech. In her paper Damer outlined the process of carefully recording and digitizing ancient inscriptions located on the exterior walls of the buildings of Herculaneum. The summer of 2014 marked the inaugural season for a team of undergraduates who traveled to the Bay of Naples to begin work on this innovative project. The hands-on project included finding, photographing and recording inscriptions that were then reimaged, analyzed and placed in two databases for ancient graffiti, the Epigraphic Database Roma- EAGLE Europeana, and Fasti Online . Damer emphasized the urgency to document the ancient inscriptions before they degrade any further. She also compared the results of the initial finds to graffiti in the neighboring city of Pompeii. In “All Those Sculptures: How Herculaneum Changed the History of Art,” Carol Mattusch considered the effects of J.J. Winckelmann’s pioneering publications of the sculptures unearthed in the Villa of the Papyri at Herculaneum. Winckelmann visited Naples four times to investigate the celebrated archaeological finds that at that time were housed in the king’s summer palace at Portici. In his History of the Art of Antiquity (1763/64), he developed a new categorization, a stylistic chronology, which, said Mattusch, “still resonates in teaching and scholarship about Greek and Roman art”. Winckelmann observed that the bronzes from Herculaneum were among the “most remarkable pieces,” and many art historians and archaeologists still consider Greek bronzes to be unique works, designating Roman marbles as copies. Mattusch believes that by discussing bronzes separately from marbles in his history of ancient art, Winckelmann set up a chain reaction that is still present in the discourse today. She argued that this thinking all began with the extraordinarily rich collection of bronzes found in one home at Herculaneum, the Villa of the Papyri..
David Sider of New York University, Vice President of the AFoH board, focused on the ancient papyri from Herculaneum in a paper entitled “Papyri as Archaeological Objects.” When uncovered during the Bourbon excavations of the 18th century, the vast library of more than 1,000 book rolls from the Villa of the Papyri at Herculaneum were brittle and carbonized, “steamed and charred.” Sider described the difficulties encountered in trying to open the damaged scrolls and noted that Padre Antonio Piaggio invented a device known as “Piaggio’s unrolling machine” which slowly pulled the individual papyri apart. Most of the texts were written in Greek, and some were in Latin. None of the procedures to open the scrolls to date have been extremely successful but there are high expectations with a new process being examined at the University of Kentucky using Computerized Tomography (CT scan). In closing, an invitation to all present was extended to join the American Friends of Herculaneum Society, and questions were taken from the large and appreciative audience.